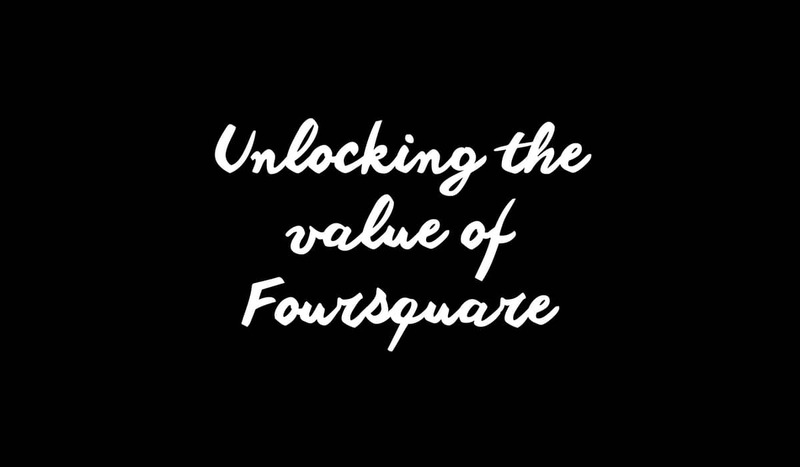 [tweetmeme]For those of you not yet using Foursquare and other location based social networking apps, the presentation below from 22 Squared gives you a bit of background on what it’s all about. I’ve been trying out both Foursquare and Gowalla for a little while and can see great potential for brands using them in the future. Foursquare is the clear favourite for me so I will focus more on that here. For me they bridge the gap between the online and offline world, something key in connecting brands with consumers and something that’s missing in current social media marketing activities. The premise is that they allow you and your friends a new way of exploring your city, or cities you visit. You can earn points and unlock badges as you discover new things. They are mobile apps and usage isn’t across all makes and models yet, but that will change. There is a competitive edge to it (the more you check in at locations, the more points and badges you win – there’s even a leaderboard), however I believe the true value is in the word of mouth opportunities they offer. I often check into a place and then make the most of the tips other users have left for that venue or those nearby. Of course, as the user base grows, so will these tips. Brands aren’t fully onboard yet, but once they do we could see some great results from these apps as social marketing tools. I’m a newbie 4sq user and the biggest outage I see so far is that I can check-in anywhere. It doesn’t force me to verify with GPS (if your phone has one, or if you have it on, or if you get a signal). So this kinda screws up the validation/credibility model for restaurateurs. I guess 4sq left this as optional, otherwise it would restrict the user base size and prevent any quick take-up, but that could also be its downfall. Despite all this, it seems to be growing in popularity, so good on them. Well done so far. Hi Luke, thanks for your comment. Am I mistaken or have you recently launched a location based bookmarking tool that would be in the same market as Foursquare (albeit loosely)? Do you see any crossover between the two types of services? In response to your points, I agree to the first. The lack of verification certainly holds back a few creative ideas I’ve had for Foursquare. Fingers crossed that will change in the future as it could greatly improve usage. I disagree slightly with the comment about any decent restaurateur knowing the clientele and looking after them anyway. In some, this is definitely the case, however I live in a very busy and over populated London and can’t see the owners of some of the busiest restaurants being able to keep tabs on regular customers, let alone create a relationship with and reward them. I believe Foursquare provides more of a chance of doing this. I also don’t believe it should be about how much customers spend in a restaurant, but rather how many times they visit. The value of a Foursquare campaign would be to drive customers back to the restaurant and create word of mouth. Also Foursquare doesn’t just have to be for restaurants, it can be for any shop, cafe or anywhere the public visits. It’s still early days, but I could see it being a very useful tool in the future. Yes I agree, lets hope foursquare tighten up their verification process with GPS, like Gowalla and Rummble do. Unfortunately money talks and I suspect that someone who spends £500 on 1 evening meal with a few select friends will probably get better service, free drinks, perhaps a bottle of wine or desert tossed in etc etc than a repeat customer that just has a beer or two on each of 50 visits, even if they bring a new friend each time. A good pickup…We about to exit our beta phase with the announcement of a few large partnerships and a brand new website. A location based bookmarking service is good description! You are on the right track, however we offer some fundamental differences to these location based check-in apps. 😉 We offer a service to all mobile users, (that is not device specific/restricting) that allows them to bridge the physical world with the online world. In a 4sq, rummble, gowalla type of application, it is consumer centric, as it should be, but the business that one ‘checks-in’ to, does not get the instant opportunity to respond to that consumer’s immediate interest with some measurable call-to-action to capitalise on their curiosity in real-time. This is our proven revenue model. Businesses are willing to pay for the opportunity to market to someone who wants to know about them (they made the request), has shown interest and has given permission. Our service executes this model and extends it not to just where you might ‘check-in’, but anywhere the business promotes themselves….newspapers, magazines, signboards, billboards, trains, busses, bus stops, radio, TV, brochures, leaflets, direct mail, local tour/restaurant guides, etc etc which is still where the majority of SMEs advertise (despite the growing online trend). As you say about 4sq not just for being restaurants, we agree, the market is much bigger than that. Thats why we also have customers in other verticals (estate agents, tradespeople vehicles, exhibitions & conferences, restaurants, fashion retailers, etc) anywhere where you might want to remember something for checking out later online….and the easiest way to do that is to use your mobile to bookmark them. I like the idea, would definitely like to look at it more.